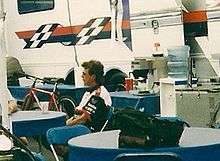 Amato relaxing in his pit area as an owner at the 2001 Southern Nationals at Atlanta Dragway in Commerce, Georgia. Joe Amato (born June 13, 1944 in Exeter, Pennsylvania) is an American dragster driver, who won the NHRA Top Fuel championship a record five occasions and scored 52 event victories, most of them with crew chief Tim Richards. He was the first driver to exceed 260 mph and 280 mph in competition. Amato began racing cars as a teenager, when he worked at his family's auto parts store. He dropped out of high school to help run the store when his father had serious heart problems; eventually, Amato built the business into Keystone Automotive, a large and successful Automotive Wholesaler and Distributor. Between 1982 and 2000, he finished in the Top 10 every year. Eye surgery forced him to retire from competitive driving at the end of the 2000 season. He then participated as a team owner until selling the business and retiring permanently in 2005. On the National Hot Rod Association Top 50 Drivers, 1951–2000, Joe Amato was ranked No. 9. He currently resides in Lackawanna County (Clarks Green). Amato has\\\\ married twice, divorced twice. In 2008, Amato's record of five championships in the Top Fuel division was beaten by Tony Schumacher, who won his sixth championship that year. Joe Amato dragster doing a burnout at the Mile High Nationals in the Denver, Colorado area. He was inducted into the International Motorsports Hall of Fame in 2005. He was inducted into the Motorsports Hall of Fame of America in 2004.